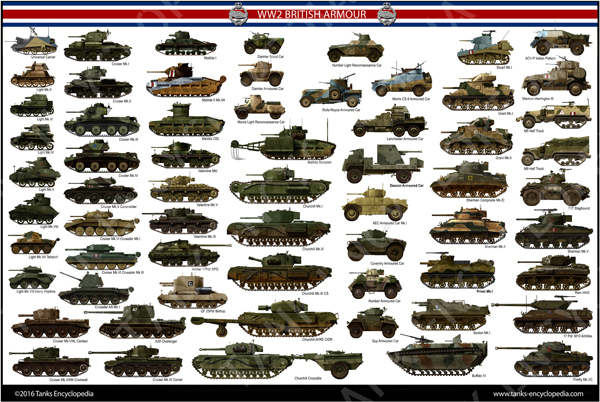 In 1942, there were already at least a dozen armored types in service with the British Army on all fronts. The Daimler and Humber, in particular, were already massively produced. However, the General Staff had plans, just like for tanks, for a universal design that could fulfill all duties, simplify training, maintenance and lowering costs. A convergence of interests and technological sharings led to the Rootes Group and Daimler producing a crossover of their own designs. This evolved into a mature 4×4 design ready for production in 1943. 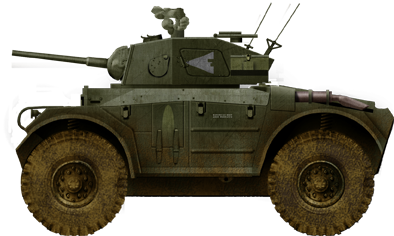 Two main types were envisioned, the standard reconnaissance type (Mark I) and the tank hunter/infantry support type (Mark II). However, the vehicle showed its limits soon after its introduction and production was curtailed to 220 vehicles out of a total order for 2600 shared by the two factories. The model was named after the Coventry plant in the Midlands, the only one to eventually manufacture the type. 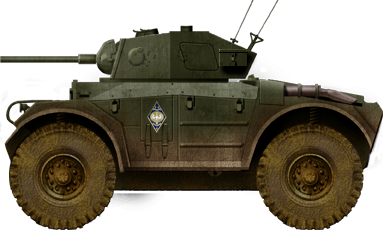 The Coventry Armoured Car was a compact four-wheel drive armored vehicle. 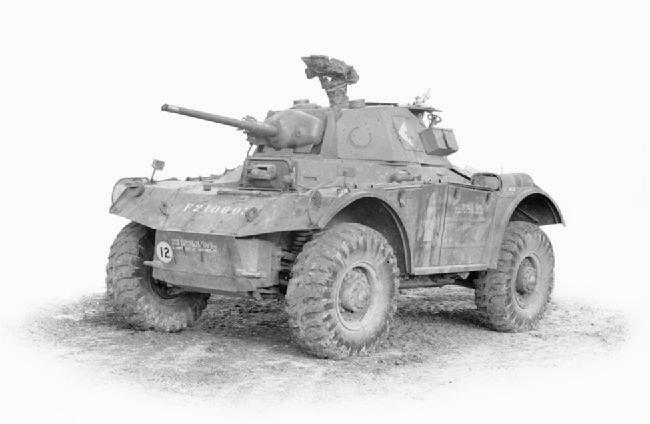 It featured a conventional suspension and drive system but was given duplicate driving controls which enabled it to reverse quickly if it needed to break quickly from a fight. The hull was made of welded RHA steel plates, 8 to 14 mm (0.31-0.55 in) at the thickest, with a sloped front, inwards sloped sides and rear and an octagonal turret with a single hatch. The configuration was standard, with the driver inside his own sloped forward cabin. He had two sight slits and a front side opening armored shutter. The fighting compartment was in the middle, with the engine compartment at the rear. Despite being less than 5 meters (16’5”) in length and 2.64 (8’8”) in width, the Coventry weighed 10.35 tonnes (11.41 short tons or 10.19 long tons). It was propelled by a Hercules RXLD 6-cylinder, liquid-cooled, petrol engine. It developed 175 hp (130 kW) for a power/weight ratio of 16.9 hp/tonne. This gave a lower-than- average 68 km/h (42 mph) top speed and modest cross-country speeds. It had a 400 km (250 mi) range. The Coventry had front-steering, but with a second steering wheel and driving controls at the rear of the driving compartment. The transmission manufactured by Commer Cars Ltd featured a 5-speed gearbox, which worked in both directions as well. The suspensions were coil springs, and the tyres were 13.50×20. Electrical voltage was 24V, which also fed a Radio W/T Set No. 19, driving and blackout lights fitted on the mudguards. The main armament (Mark I) comprised the standard British 2-pounder (40 mm/1.57 in). In late 1943, this was less than desirable against German tanks but still adequate against most light vehicles. It was coupled with a coaxial BESA machine gun, fed with around 2,000 rounds. The turret, in this configuration, also accommodated the gunner, loader and commander. It had a 6 faced shape and was manually traversed. The turret also held the gunner and commander periscopes, a side projector, and two smoke dischargers which were mounted at the rear of the turret. The gun had a cast mantlet and was elevated manually by the gunner using his shoulder, as was usual for 2-pdr mounts at that time. 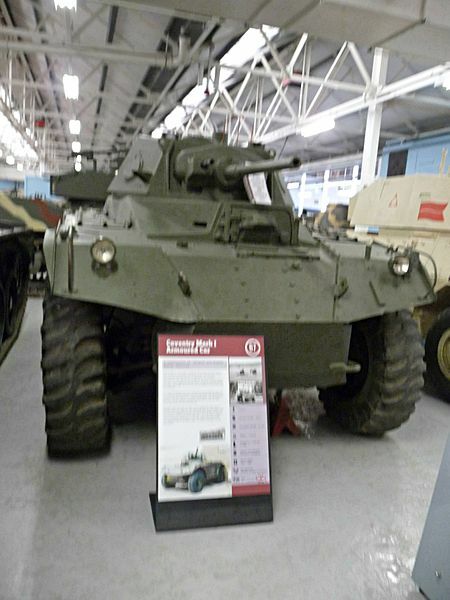 The Mark II, however, also designated AFVW90, was given a much larger turret, which slightly resembled the one used on the AEC heavy armoured car, armed with the QF 75 mm (2.95 in). The size of the gun meant that one less crew member could stay in the turret. Therefore, the gunner had to be assisted by the commander in loading the gun. There was, at first, an order for 1700 and 900 vehicles of both versions. Production began in June 1944, 63 vehicles being delivered by the end of the year at the Humber assembly line. It was however decided that Daimler should resume production of its own vehicle rather than convert and tool up for the Coventry. The final order was eventually reduced to 300, all for the Humber plant, of which only 220 in total leaved the assembly line at the end of the war. The Coventry Mark II was never produced, and the whole order for 900 units was canceled. The first batch was apparently meant to be sent to India, but a few were deployed by the British Army in 1945, operating in Germany in the last days of the war. They saw very little or no action at all. Their deficiencies were well known and the type was quickly demobilized after only a few post-war years of service. However, 40 were sold to the French in 1946, equipping two Tunisian Spahi squadrons. In October 1947, both squadrons were sent to Indochina, affected to the 5th Cuirassiers, operating against the Viet-Minh with mixed success until 1952. The Coventry was described as “slow and fragile”, but was relatively popular with its crews. As a side note, one of these was even given a tailored air-conditioning unit. 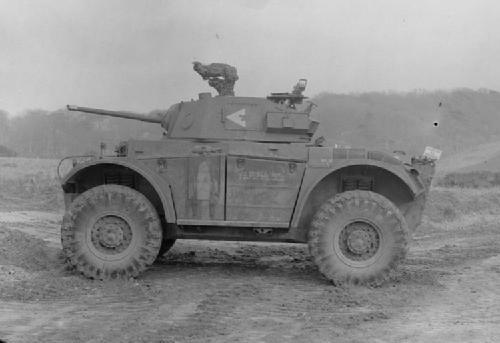 Coventry Armoured Car, early production version on trials, summer 1944. Coventry in French service, 2nd Tunisian Spahi, 5th Cuirassiers, Indochina, 1947-52. 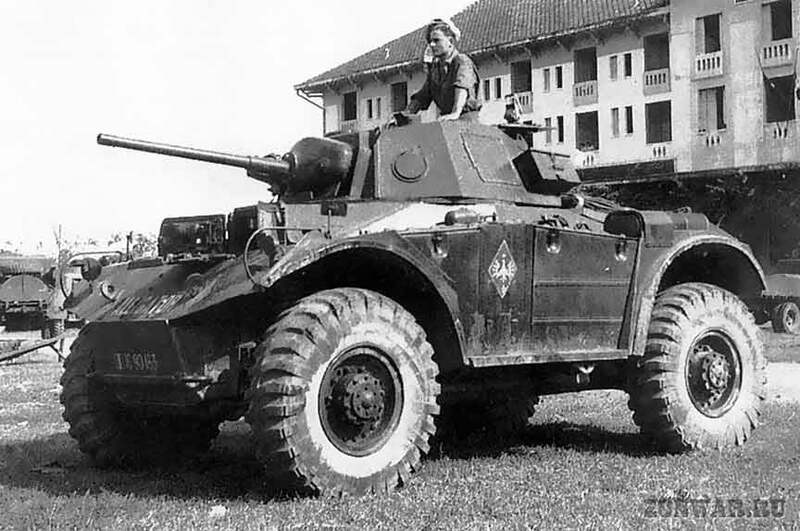 French Coventry AC in Indochina, 1947-52.